Student: Wow; no more overbearing, lines for the filling. Now I can see the cluster numbers clearly. Outstanding! Figure 14-6. 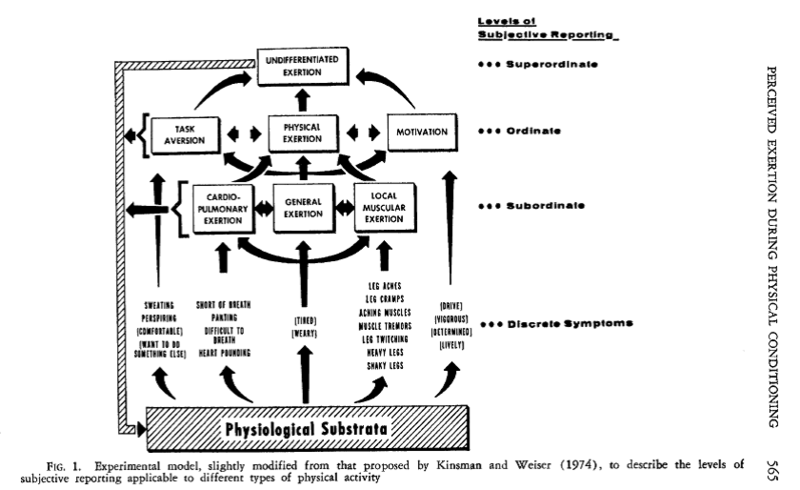 Pyramidal schema describing levels of symptom report during prolonged cycle ergometer work (from Kinsman & Weiser, 1976). Student: You two integrated these into quite a hierarchy. Anyone discuss or use this chapter? Professor: At the 1975 ACSM Annual Meeting, Kent and I crossed paths, and I thanked him for grabbing onto the pyramidal concept. Over the next years, I shifted into pulmonary physiology and dyspnea research and later became a certified Program Director for Cardiopulmonary and Adult Fitness Programs. Student: AYE WHAT!? Is that kind of poet license what research is all about!? Professor: Shrugging my shoulder is what I do about this. 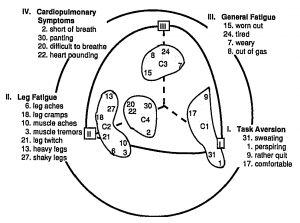 From most of the 1980s and on, I did a few studies about exertion, fatigue, and dyspnea. Yeah, this sage saddens me, and I can move on from the saga. Next: it’s a fuzzy area between mechanisms for processing sensory signals first, into sensations, and then, into perceptions pain. So, next week the Stockholm presentation given in 1975 will review an attempt to clarify this fuzzy area. Dishman RK. 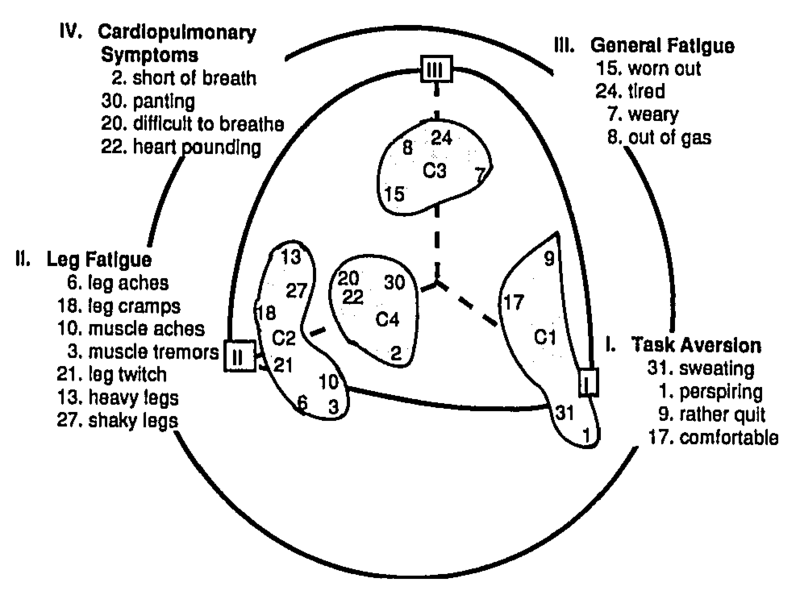 (1994) Prescribing exercise intensity for healthy adults using perceived exertion. Medicine and Science in Sports and Exercise 26: 1087-1094. Ekkekakis P, Petruzzello SJ. (2002) Biofeedback in exercise psychology. In B. Blumenstein, M. Bar-Eli, & G. Tenenbaum (Eds. ), Brain and body in sport and exercise: Biofeedback application in performance enhancement . Chichester, England: John Wiley & Sons. pp. 77-100. 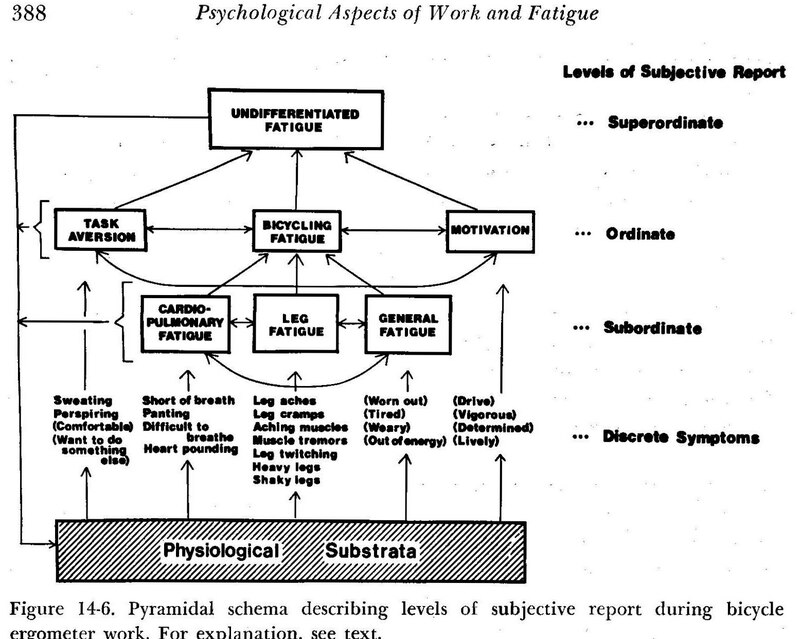 Kinsman, R. A., & Weiser, P. C. (1976) Subjective symptomatology during work and fatigue. In E. Simonson & P. C. Weiser (Eds. ), Psychological aspects and physiological correlates of work and fatigue. Springfield, IL: Thomas, pp. 336-405. 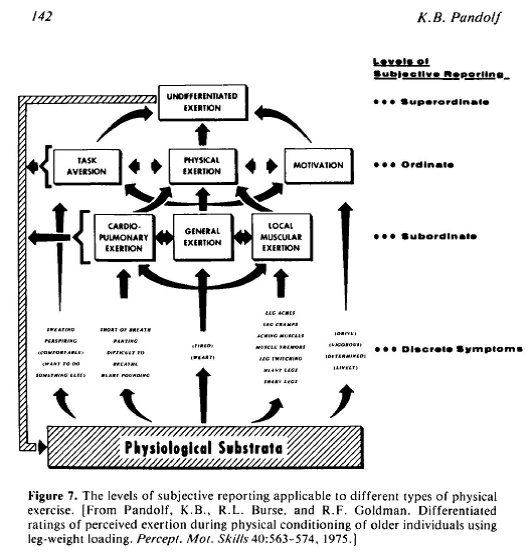 Pandolf K. (1983) Advances in the study and application of perceived exertion. Exercise & Sport Sciences Reviews 11: 118-158. Pandolf K, Burse RL, Goldman RF. (1975) Differentiated ratings of perceived exertion during physical conditioning of older individuals using leg-weight loading. Perceptual and Motor Skills 40: 563-574.